It’s not Chinese New Year without a slew of feel good, family-themed comedy movies hitting the big screen. For next year, expect to see “A Journey of Happiness” among the New Year entertainment roster. Well-known Malaysian entertainer Ah Niu and Taiwan-based Malaysian actress Lin Min Chen are joined by Hong Kong stars Joyce Cheng, Jerry Lamb, Alex Lam and Lo Hoi-Pang in the upcoming comedy. Notably, the dialogues being largely in Cantonese was the talk of the town for this jolly cast. 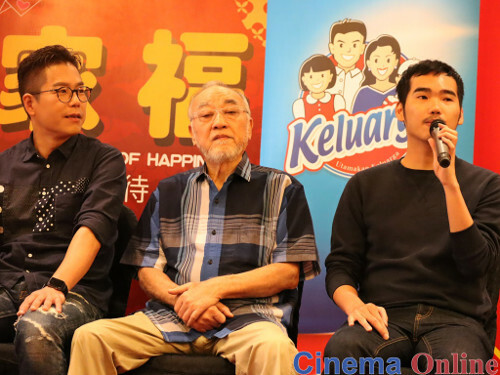 “I spoke fully in Cantonese,” Lin admitted happily, adding that there was no dubbing needed, during the press conference held at Dorsett Hotel KL recently. Her joy was understandable since the actress, who is more comfortable speaking in Mandarin, had previously appeared in Hong Kong movie “Vampire Cleanup Department” but due to her limited Cantonese skills at the time, only received a non-talking role as a vampire. Meanwhile, TV host Jerry Lamb remarked on the distinct difference between the Cantonese spoken in Malaysia and the one spoken in Hong Kong. “When we received the script, we noticed that the dialogue structure was different,” he said. The Hong Kong cast members then gave director JY Teng their input on how to revise the script and make it more natural sounding for a native speaker from Hong Kong. This was important in keeping the movie realistic since it does focus on a family of four from Hong Kong that is visiting Malaysia for some quality bonding time. of director JY Teng’s (right) sophomore directorial effort. The movie is currently filming in several locations in Malaysia, including Cameron Highlands, Ipoh and Kuala Lumpur. With an investment of RM3.15 million, “A Journey of Happiness” is produced by Mani Man Pui-Hing and Aron Koh, who previously co-produced “Show Me Your Love”. Director Ryon Lee this time takes on chief script-writer role while JY Teng, whose feature directorial debut was this year’s “A House of Happiness”, will be helming the new movie. “A Journey of Happiness” follows the Siew family, made up of the father Siew Fatt (Lo Hoi-Pang), who becomes depressed after his wife passed away; eldest son Siew Beng (Jerry Lamb), a property agent who often exaggerates to get sales; only daughter Siew Shen (Joyce Cheng), a famous and busy tour guide; and youngest son Siew Lup (Alex Lam), a jobless youngster who often daydreams of becoming a world famous internet influencer. To help rekindle the family’s strained relationship, Siew Shen takes them on a tour to Malaysia, where the family meets cunning tour guide Cui Fong (Ah Niu), backpacker Pumpkin BB (Lin Min-Chen) and hostel owner Orchid (Siu Yam-Yam). Hilarity ensues after meeting the three and when the group accidentally enters an aboriginal tribe village, it becomes an even more unforgettable journey for the Siew family.